with global hotkeys or from the tray icon's menu while in the background. 01/04/14 - v1.72 - This is the last version to support Windows XP. This program is donationware... if you like it and want to see me keep developing it you can send me donations. Display track info on song change, including artwork! Several people have mentioned iTunesKeys is crashing for them. Running iTunes with the /regserver option seems to fix this. Optimized display of track info. Blank window should be less visible on track change now. Fixed display of track info that contains quotes. iTunesKeys is now compatible with Windows 10. Windows 10 seemed to break a lot with iTunesKeys. But I was able to get the iTunes interface working with newer .NET versions. Because of this I'm able to use Chromium as the display for track info instead of Internet Explorer. It makes for a bigger download but it should be better overall. Added more RPC error handling. Added error handling when quitting iTunes. Improved handling of invalid config files. for the embedded browser in 64-bit Windows. I changed the track info popup to display an HTML page instead of a Windows Form. The downside is this won't work right on Windows XP. which is limited to IE 8 on Windows XP, which has poor HTML/CSS support. If you use the default page the popup will mostly look like it did before. which get written to with the current track info. After that, the trackInfoUpdated() function is called. update the track time progress bar. After creating your own page, you can create whatever layout/formatting you like. Disabled the title change on Windows XP. It was making an ugly gray bar at the top of the iTunes window. Fixed the font color selection in the popup format dialog. Created a nicer looking track info popup and icons. Changed Rewind/Play/Pause/Fast Forward behavior to work better with iTunes. Added a hotkey for cycling the repeat mode. Fixed a bug with the Show/Hide iTunes option. Fixed compatibility for 64-bit systems. Fixed display of ampersands in the track info. Fixed an error with radio streams. Made an option to change the padding on the track info window. Added support for displaying track info on multiple displays. 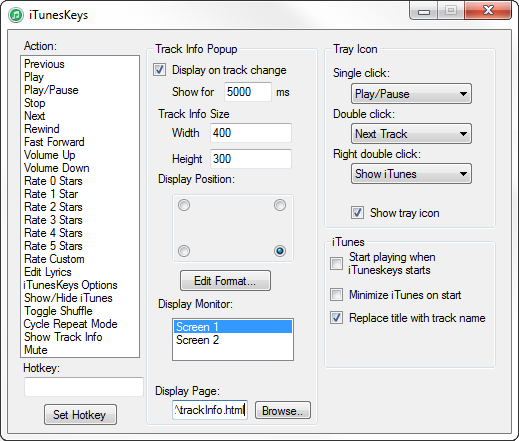 Added an option to minimize iTunes when starting iTunesKeys. Fixed a problem with invalid config files. Fixed the track info positioning problem. Made the track info window not show in the Alt-Tab list. Changed the method used to put the track info window in a corner. Hopefullly this will fix the problems people were having with this. Removed the message when a second instance of iTunesKeys is run. Added an option to show the track info window in any corner of the screen. Clicking the track info window will now hide it. Added a track position bar to the track info window. Fixed some bugs with the track info window. Fixed a bug with the track info not showing. This version is pretty much a total rewrite of iTunesKeys. and the problems with iTunes 8 helped move it along. I took out the downloading of album art. Added a double right click command to the tray icon. Changed the 'Show iTunes' command to match any iTunes class window. Added a mute command to iTunesKeys. Added Unicode support to the track info window. Added options to show year and genre in the track info popup. You can also toggle off all of the other elements displayed there. Added an option to resume the last track that was playing when you quit iTunes. Tweaked the the play/pause controls behavior when fast forwarding/rewinding. Added a prompt when you exit iTunesKeys. Added a menu item to set a custom rating for songs. You can set half stars this way. Added an option to the installer to restore the tray icon. Added option to change the duration of the track info popup. Fixed the iTunes not minimizing bug. Fixed the window resizing with small fonts. Fixed the display of the tray icon. Changed the sizing of the track info window. Fixed the tray icon in Windows XP. Fixed a problem with the hotkey setting. Fixed a couple minor bugs. Fixed a startup crash problem. User can now select behavior on tray single/double click. Added icons to the tray menu. Track Info window now displays the track rating. iTunesKeys now prevents the "One or more applications..." message when quitting iTunes. Fixed a bug with the track info window size. Added the ability to customize the appearance of the track info window. Added online update check support. if it is already in the foreground. Added a hotkey to show the iTunes window. Improved the album art search. The 'click tray icon for next track' feature can now be toggled. When album art is found, it now adds the art to the other tracks on the album. Can now download album art for tracks that don't have it. Fixed the focus steal bug, so the track popup doesnt take the focus. You can now limit the display size of the artwork. Added support for more artwork types(jpg, png and bmp). Single-clicking the tray icon will now go to the next song. Added a hotkey to re-show the track info. artist, track name, album, track number and artwork (jpg only). Added support for more keys, like "`". Added a hot key for toggling shuffle. Added hot keys for Volume Up/Down and to show iTunesKeys. Added the option to hide the tray icon. Changed iTunesKeys so that only one instance will open.